Hello, Comic-Con folks — we love you, seriously–we do!– but c’mon — you gotta give us more than two days to get ready for the DREADED hotel sale…. I mean, seriously, that’s smack dab at the beginning (or middle) of most people’s workday, and making arrangements ain’t always that easy. Heck, additionally, there’s this little thing called Star Wars Celebration that a lot of us are heading to, and it’s too late now to change our airline tickets to accommodate this LAST MINUTE schedule announcement. I’m 30 minutes into air travel at 9 a.m. California time. DON’T GET ME WRONG — I know it sounds like I’m whining (which, I guess, I am…. I’ll work on that). But what’s the reason for SUCH SHORT NOTICE? Is it intentional so that fewer people are able to participate? I’m sure there’s a reason for this strategy, but right now it just seems like sucky planning. Okay…. I got that off my chest. I’ll take some breathers now and try to figure something out. I’ll try to beg, borrow and steal to get some people to apply for a spot for me. Again, NO HARD FEELINGS….. but please, please, please consider a bit more advance warning next time…. your biggest fans would appreciate it. 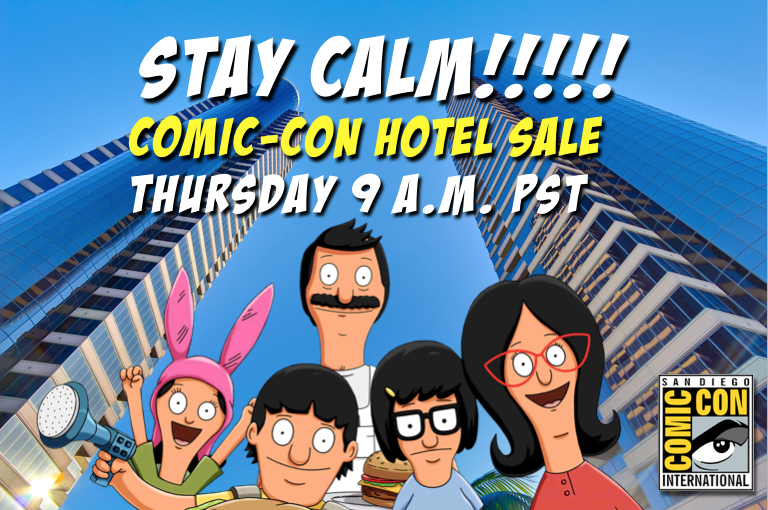 For those of you who haven’t yet heard about the hotel sale, here’s the notice that want out today from Comic-Con International. Make your plans and say your prayers….. HOTEL-POCALYPSE hits Thursday! Ready to celebrate Comic-Con 50 with us? It’s almost time to book your hotel room! Below you will find the link to the waiting room/hotel reservation request form for Comic-Con 2019. The waiting room will open at 8:00 AM Pacific Daylight Time (PDT) on Thursday, April 11. Important! Downtown hotels are limited and in high demand. Read all the information below on how to prepare in advance and make the most of your time in the waiting room. Beginning at 8:00 AM Pacific Daylight Time (PDT) on April 11, you may access the waiting room via the link above. The time you enter the waiting room has no impact on your position in line. At 9:00 AM (PDT), all users in the waiting room will be granted access to the form in random order. If you enter the waiting room after 9:00 AM (PDT), you will be placed at the end of the line and your chances of getting a room will decrease. To understand how the hotel request process works, please review the details on our hotel page by clicking here. We highly encourage you to research and make a list of the hotels you have in mind sometime before the sale. You may select up to six (6) downtown hotels and six (6) non-downtown hotels for a maximum request of 12 different hotels. Only one (1) hotel selection is required to submit the form. The full list of hotels is available on our hotel page. Hotel requests may also be accepted by web or by phone beginning at 9:00 AM (PDT). To submit your request over the phone, please call onPeak at 1-877-55-COMIC (1-877-552-6642) or 1-212-468-5283. Thank you in advance for your participation in this year’s hotel sale.